Happy Pinktober! October is the month when all the land goes pink for breast cancer awareness. I’ve written about this before but here I am again to make you aware of the deceit that takes place from companies looking to make big money from the disease and others who do great work on behalf of those of us personally affected by it. In one of my many conversations about environmental links to breast cancer with my good friend Manya Williams, she encouraged me to watch Stink! – The Movie. I immediately purchased it and was blown away. This heartfelt documentary is about a widowed husband who’s wife died of breast cancer. STINK! opens with a foul smell and a pair of kids pajamas. This now single dad goes on a quest to try and find out where the odor is coming from. Instead of getting a straight answer, director Jon Whelan stumbles on an even bigger issue in America, which is that some products on our store shelves are not safe. Watch “STINK!” free this October only for Breast Cancer Awareness Month and share this with all your loved ones. THIS IS ACTUAL AWARENESS, PEOPLE! As 1 in 2 Americans will be diagnosed with cancer in their lifetime, consumers urgently need to know about the hidden cancer-causing chemicals lurking in their everyday products. Most consumers wrongly assume that if a product is on the store shelf then it must be safe. 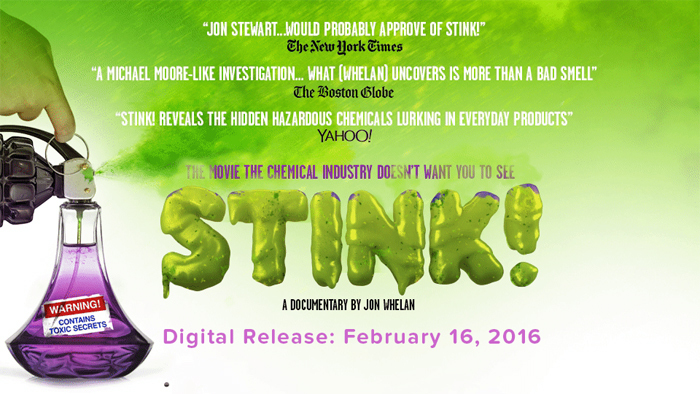 “STINK!” reveals the truth about chemical and cosmetics regulation in America that every person needs to know. Follow director Jon Whelan on his unexpected journey as he tries to uncover the truth about the secretive chemical industry. Entertaining, enlightening, and at times almost absurd, “STINK!” takes you on a madcap journey, from boardrooms, to back alleys, through the halls of Congress, and finally, to the sickening discovery of the “Cancer Loophole.” This is the movie that the chemical industry doesn’t want you to see. After a breast cancer diagnosis in 2008, Eileen became her own Self-Healthcare Activist. She is an Integrative Cancer Coach and works full-time helping patients do more than just survive at Columbia University’s Cancer Center in New York City. watched it…makes me sad. But it also reminds me of how important the work that we do is:) can not wait for you to get some Life On Mars Beauty products in your hands!!! (soon!!!) thanks for letting us know about this film!